The former Park Geun-hye government maintained a list of more than 9,000 artists deemed critical of the government and used it to disadvantage them from various state support programs, a civilian-government truth committee said Tuesday. 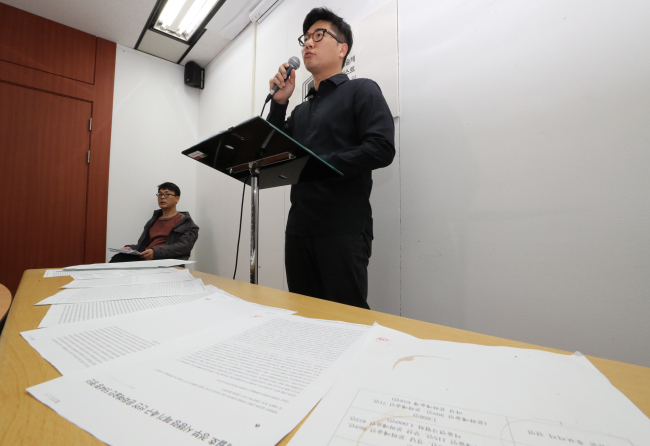 During a press conference in Seoul, the committee for finding the truth behind the "artist blacklist" unveiled a government document that includes a total of 9,473 names allegedly excluded from various programs to support artists. They were disadvantaged simply because they signed at least one of the many joint statements issued to criticize Park's handling of the Sewol ferry sinking that claimed more than 300 lives in 2014 or expressing support for candidates from her rival party in various elections, the committee said. Each page of the document had a date showing it was printed out in May 2015, a month after it was created by the Ministry of Culture, Sports and Tourism at the instruction of the presidential office under the Park government. The government also used the 60-page-long list to determine whom to exclude from its 10 billion-won ($9 million) project to mark the 2015-2016 Korea-France Year, celebrating their 130th anniversary of diplomatic relations, the committee said, citing statements from multiple cultural officials involved in the project. The two countries ran a series of cultural exchange programs in their major cities to mark the landmark anniversary from September 2015 to December 2016. "We obtained the document in the process of investigating how the blacklist affected the 2015-2016 Korea-France Year and collected many testimonies that this document had actually been used to decide whom to exclude from state programs," Lee Won-jae, spokesman for the committee, told reporters. The presence of the list with 9,473 names was first learned when a local media reported about it in October 2016, igniting speculation that the former conservative government maintained a secret register of artists deemed critical of the government. But the ministry and its then-Minister Cho Yoon-sun denied the existence of the artist blacklist. This marks the first time that the document was made public and that it was confirmed that the document was used as a means to bar artists critical of the government from state programs to support them. Because of the importance of the secret list, the committee said, an unnamed culture ministry official in charge of handling the computerized file had to print it out and send it to relevant departments in the ministry whenever they needed it to select beneficiaries of government support programs. The committee also said the ousted President Park handed out a budget for a Korean food experience event in France in just three days to provide preferential treatment to her longtime friend and confidante Choi Soon-sil.